Forest Inventory App is an Android application specially designed for foresters and other natural resource managers to collect data in the woods. This app assists surveyors to record customized data efficiently throughout the timber cruising. Considering all sorts of working scenarios within sample plots and along the journey, this design not only collects location-based GIS data but also provides the interface to quickly input tree and plot information in an amazingly flexible way. After the inventory, users will find that all the collected markers, tracks, photos, and exported forms are ready for further applications, orderly organized in the folders according to the data type and sample plots where they were collected. With Forest Inventory App, you can:1. Effectively record plot and tree attributes.2. Easily record the coordinates, elevation, slope and aspect with Android mobile devices.3. Apply camera function to take pictures and store photos in a list.4. Save all the collected data in a database within the mobile device.5. Export the collected data as CSV files after timber cruising.6. Manage the files in Task folder with ease. It is always important to get ready for sampling and proper preparation before starting the field work. 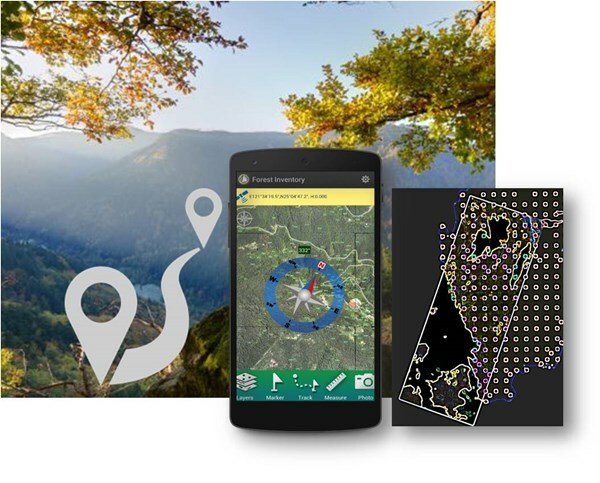 Since the working hour for forest workers and inventory jobs are rather precious, being well prepared for both equipment and routing will save a lot of time and cost.In consideration of various purposes and environments, Forest Inventory App also allows users to modify and add-up parameters like tree species and plot environments. Simply work through the settings, easily build up a default template for the task and save lots of time with the field work.While nowadays the sampling area or plots are mostly decided by Desktop GIS, Forest Inventory App allows users to apply vector data (*.SHP or *.GEO) or export cached map (*.SGT or *.STP), and then users can easily apply in Forest Inventory App for navigation. Moreover, users can also markup the destination via Marker and find the best route to every destination. GPS tracklog and E-compass are also practical tools for recording track history and helping surveyors to find the location and direction. Now it is the time for the field work. Build up a Task Project for your work with proper coordinate system support, and follow the system instruction to create sampling plot for data recording. Useful parameters had already been setup as default including environmental data like Soil Type, Concession, Forest Type or Topography. 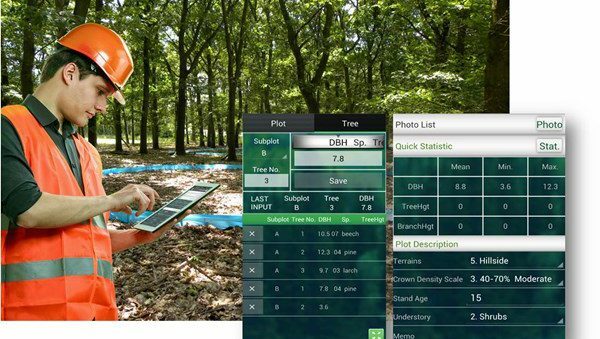 Users are also allowed to take photos and to do a quick measurement of Center Point, Slope, and Aspect via GPS, and to utilize gyroscope within the Android device, which is a much better solution than traditional equipment such as Theodolite or slope meter.Forest Inventory has been specialized for tree data recording as well. A well-designed workflow will help user to input data in fastest way and able to hot swap between different plantation data, which having great help if you are working with three or more surveyors at a time. All data will be stored appropriately in SQLite DB to prevent from data loss and provide users to quick check the data quality via statistic results. As the timber cruising and inventory were done, the collected data can be exported as CSV format and are ready for further use. Photos and Track Log will also be collected in the Project folder. All data will still be stored stably in the DB, so users will be able to review the historical data anytime, which is also a backup mechanism to prevent data loss. To conclude, Forest Inventory App is a perfect mobile GIS solution to provide foresters a professional and handy tool for field survey and data recording. With this App, natural resource managers can quickly record the required information during field survey and improve task efficiency. Fax: ©2019 Supergeo Technology Inc. All rights reserved.